My friend Jamie (Life’s a Feast) is throwing herself a birthday party for BreadBakingDay this month. A very special bread is therefore in order, and I think this fills the bill. 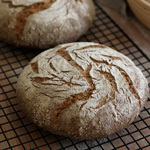 Distinctive in both appearance and taste, it derives an earthy flavor and rich deep brown color from buckwheat flour, and sweetness — but not too much — from toasted walnuts and wine-soaked pears. Before making these loaves at home, I had made the bread several times at SFBI — including for my bread practical exam — and it never disappoints. 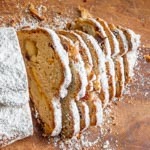 As a testament to its universal appeal, I’m thrilled to congratulate my friend and classmate, David E, who just today won the SF Food Wars People’s Choice Honorable Mention with his interpretation of the bread, presented to 200 discerning tasters at the SF Food Wars artisan bread bakedown. Go David and go Pear Buckwheat! 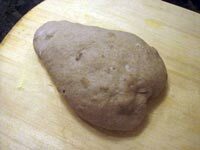 The shaping is quite uncomplicated (see the recipe for instructions), and so is the pear stencil used to decorate the loaf. 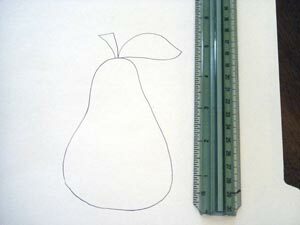 Don’t think you need to find some fancy pear picture, just draw one freehand. If I — who, if I recall correctly, got a “C” in fruit drawing in fourth grade — can do it, you know there can’t be much to it. Five or six inches tall is about right, and a manila folder works well. In a bowl, combine the buckwheat poolish ingredients. Cover and ferment at room temperature for 12 – 16 hours. When it is ready to use, the surface of the poolish will be pebbled with bubbles and have a few creases. 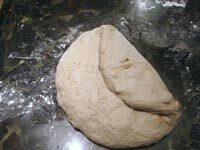 In the bowl of a stand mixer with a dough hook, combine all of the final dough flour, yeast, salt, poolish, and most of the water. Mix on low speed until the ingredients are well-incorporated. 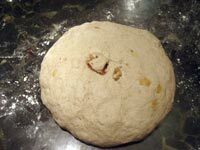 Adjust the water as needed to achieve a medium consistency dough. 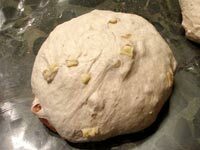 Add the walnuts and pears and mix in low speed just until they are evenly distributed throughout the dough. Transfer the dough to a lightly oiled container. Cover and ferment for 1.5 hours, with a fold after the first 45 minutes. Turn the dough into a lightly floured counter. Divide it in half and preshape it into balls. Let rest, covered, for 20 – 30 minutes. 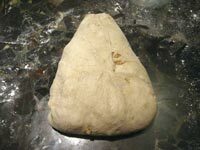 Shape each ball into a triangle as follows: flatten the dough into a disc, seam side up. Fold in each side, and then the bottom. Make sure the flaps all overlap each other (bottom left photo). 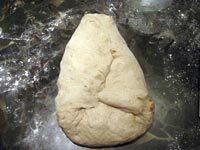 Turn the dough over (smooth side up) and gently even up the triangular shape (bottom right photo). 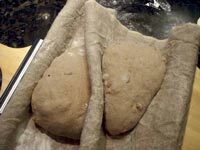 Place the loaves seam-side-down in a floured couche or floured board and proof, covered, at room temperature for 1.5 – 2 hours, or until the indentation left by a fingertip springs back very slowly. 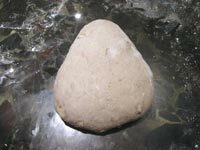 The final shaping and stenciling of the loaves is done on the peel: Gently shape the loaf into a pear by tucking the sides in a bit towards the narrow end and making a dimple in the wide end. 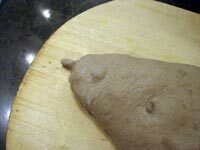 Pull out a small bit of dough and roll it between your fingers to form the stem. 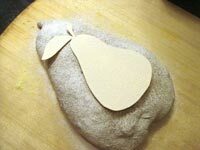 Place your pear stencil on the loaf and sift flour over the surface; carefully remove the stencil. Score once or twice on each side outside the stenciled area, as shown. Once the loaves are in the oven, reduce the temperature to 450F. Bake for 8 minutes with steam, and another 20 minutes or so without steam. Then turn off the oven and leave the loaves in for another 10 minutes, with the door ajar. The crust should be a deep brown. Oh, Susan, leave it to you to bake something fabulous for my BBD Birthday Party! Wow! Pears soaked in wine? Ooof that is just what this party needs! And I think your pear – both the drawing and the bread – deserve an A+! What an incredible bread! Thanks for baking this! This looks amazing! One of the most beautiful bread I’ve ever seen! Your breads keep on getting better and better! This one that is high on my list to try. 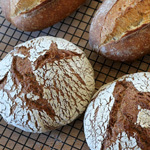 I am going to try Gerard’s levain once more. I have to impress a visitor from France,(the owner of the cottage in the mountains)soo..I will try to bake it in the midst of all the packing choas around me. Do you soak the pears in any old red wine, or do you use something particular? I so wish this would appear in my kitchen! I’ve no idea how you do it all, Susan, but you do – and you do it well! Well how cool is that! I love it! This is true art work. 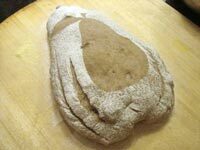 I have always wondered how buckwheat flour in bread from what it looks like it’s a workable dough. 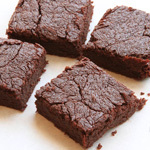 What can I use besides buckwheat flour? I’m allergic to buckwheat. Jean, the original recipe called for white wine; I used red. Any wine you like should be fine. Those are great-looking loaves! The pears and walnuts sound delicious in them too. This is absolutely gorgeous. I have tons of buckwheat flour on hand . . . . 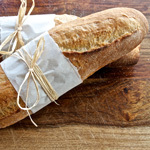 I love the look of these stencilled breads! And this sounds like it would be delicious. Do you soak the pears in red or white wine? The original recipe called for white wine, but I used red. It’s all good. Thank you for the clarification, Susan. Now to find some decent looking pears to oven-dry. What a beautiful loaf! The stencil is adorable and I like the combination of nuts and fruits very much. Stunning! And I love the flavor combination. 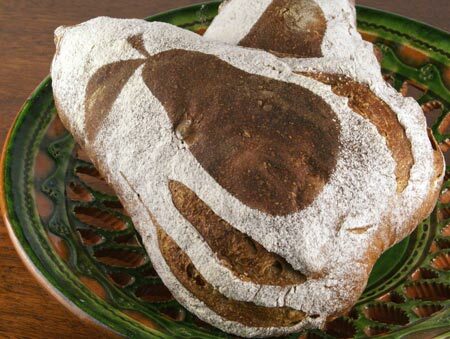 Using a stencil is such a great idea for decorating a loaf–there are so many possibilities. How amazing is this! Wow – I would love to try something this creative 🙂 The most creative I have been is a Disney castle cake for our daughter and Sponge Bob for our son lol! 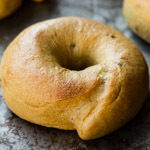 I know it is supposed to be Buckwheat, but I would love to use Kamut khorasan wheat flour for sure though – thanks for sharing this. 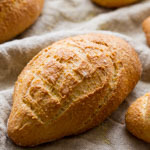 This is a wonderful bread, I’ve baked it too and it’s delicious!! 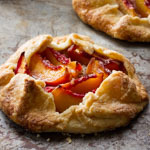 Looks amazing with that pear-shape on it in flour doesn’t it! Susan, I bought a bag of organic buckwheat flour in a cloth sag on impulse and then I realized there’s not a lot of recipes out there for buckwheat breads. When I found yours, I was so eager to try it out. I’ve made it twice now with raisin soaked in rum. They’re such soft, flavourful, tender loaves. Just amazing. 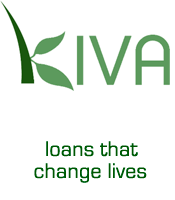 Thank you for a great formula. I’m going to experiment more with buckwheat flour now. i know this is an old post, but i made this bread this week and it’s awesomely good.